Ever since moving to New York, and ever since a single ticket to the movies soared past the $11.50 mark, I have become more discerning when it comes to the movies I see in the theater. $24 for two people? *dies* If it's not a must-see, I might as well just wait till it comes out on DVD and buy it for the same price. Rottentomatoes.com has become my go-to site for determining whether or not a movie is worth my time. If the "freshness" rating is high enough, I'll browse around the critic quotes and then decide if I want to spend the money, or if I want to wait a few months and Netflix it. I had been looking forward to The Golden Compass all year, and I was disappointed to see that the film was only averaging a 44% approval rating, although that was not enough to sway me from seeing it opening night - just enough to keep me from re-reading the books before hand. I wanted to approach the film as a stand-alone story, without comparing every frame and every line of dialogue to a superior book that is still fresh in my mind. The film is not flawless by any means, but it could be worse. 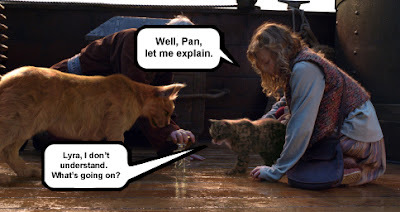 As far as epic fantasy films go, His Dark Materials is a tough series to tackle, especially when compared to the fairly straight-forward Lord of the Rings - sure there's a race of little people, Elves, and Dwarfs, and then there's the whole super-powerful ring, but all of this can be summed up very easily in the opening prologue. 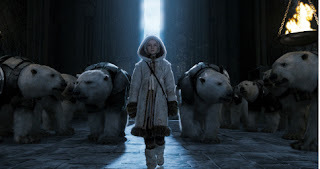 His Dark Materials, on the other hand, has people with souls in the forms of animal companions, a race of armored polar bears, sentient particles of Dust, and parallel universes on top of parallel universes. Try summing that up in a paragraph! Never mind that I just did. The heaviness of the material (hello, religious controversy) was toned down to court the masses, as a $180 million Hollywood blockbuster always will, but the central message was retained, if in a somewhat diluted form. There is still hope if the film is successful enough to warrant the production of the sequels as the director, Chris Weitz, has every intention of getting as much out of the next two books as he can. If The Golden Compass is enough of a success, he may be given free reign to explore the ultimately much darker and much more controversial sequels. And then there's always the director's cut, extended DVD to look forward to. Which brings me to my next point: The theatrical release of the film is too short. It could have done well with a full three-hours (or at least two and a half), so that there would have been time for actual character development. Instead, all we get is a name and a vague reference to race and/or place in society being thrown around whenever someone new pops up on screen. It doesn't help that most of the names are complex and foreign (and technically two names per character, if you count their daemons). I'll give the film a break here for a couple of reasons. 1. Nothing really happened in the first movie that was hinging on emotional attachment to the characters, unless you count the much-hyped polar bear wrestling match. 2. 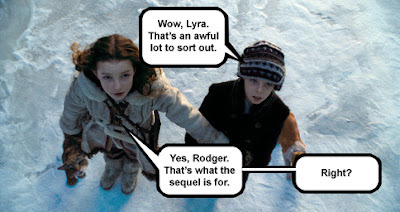 The (theoretical) sequels offer much, much more room for character development. Don't let Nicole Kidman, Daniel Craig, Eva Green, Sam Elliot, and even Kathy Bates (yeah, she was in the movie too) go to waste! Although most of the film is well-paced, there are several bits thrown in at random and scenes that were so rushed they required lots and lots of exposition to explain what was going on, as there was (apparently) no time to actually ACT IT OUT. The filmmakers, fortunately, discovered the perfect way of doing this. 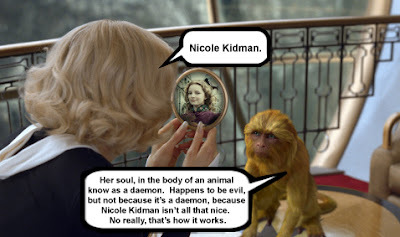 In the film's world, daemons exist so that they can be confused and question the characters, who then have the opportunity to explain what is going on, for the audience's benefit. This makes the daemons seem redundant. Apparently souls are not terribly bright independent thinkers, and the filmmakers don't think we are either. This film is not a stand-alone story and most likely couldn't have been, regardless of how it was adapted. A twist-ending (and a major cliff hanger) were pushed to the (theoretical) second film, and to compensate for this, a lengthy monologue by the heroine was added to the end of the film, for the sole purpose of getting us excited about the next chapter of this epic fantasy saga. Lyra literally announces everything that she plans on doing in the next movie - from seeking out her uncle (ah, so Bond will be back) to discovering what Dust is (yes, what IS Dust? ), to her desire to explore the parallel universes she now knows exist. Wow, that sounds like lots of fun! Wouldn't it be great if we could all go along for the ride? Of course, all of this speculation is dependent on there actually BEING a second movie. The intent of the "let's sum up what happens next" final monologue was so transparent it was an unintentionally funny and annoying way to wrap it all up. In case it wasn't clear that there needs to be a sequel ... now the audience knows for sure. But you know, I still liked it. And I'll be re-reading the series now.